As a leading carpets and carpet tiles company that operates in over 100 countries, developing products for hotels, homes, cruise liners and airlines, government, education, corporate offices and healthcare, Desso, committed to sustainable development, tries to design and offer products that can be recycled infinitely, without quality losses. 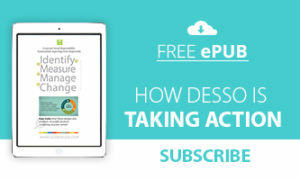 This case study is based on the 2015 Sustainability Report by Desso published on the Global Reporting Initiative Sustainability Disclosure Database that can be found at this link. Through all case studies we aim to demonstrate that CSR/ sustainability reporting done responsibly is achieved by identifying a company’s most important impacts on the environment and stakeholders and by measuring, managing and changing. In its 2015 Sustainability Report Desso identified a range of material issues, such as customer health & safety, product environmental impact, material health, environmental impact of supply-chain, natural & social capital accounting. Among these, designing and producing recyclable products containing recycled content stands out as a key material issue for Desso. To identify material topics, Desso carried out a stakeholder survey, sending out a total of 198 surveys, of which 62 were completed by stakeholders (a 31% response rate). What actions were taken by Desso to design and produce recyclable products containing recycled content? In 2014, the amount of defined recycled content for carpets, carpet tiles and sports pitches more than doubled from 5% in 2013 to 10.5%, and doubled once more in 2015, to 20 per cent. Desso, in accordance with the Cradle to Cradle philosophy, puts a lot of emphasis on the early phases of product design, striving to achieve a better design in the first place, to make sure materials used will be healthy for use and recycling. 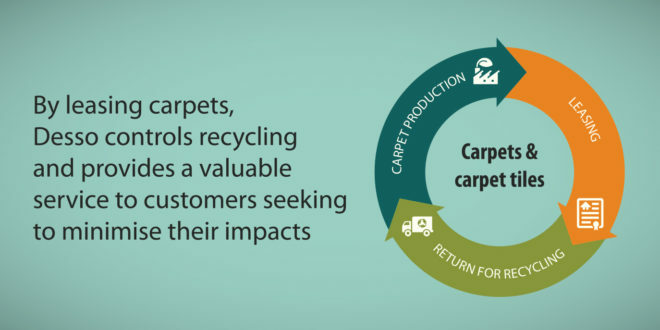 [tweetthis]By leasing carpets, Desso controls recycling and helps customers minimize their own impacts. [/tweetthis] In 2014, Desso and DLL, a global financial solutions partner, offered Desso’s customers the option to lease rather than own the carpets they require, which makes Desso better able to ensure products are returned for recycling. Note to Desso: With each case study we send out an email to your listed address in request for a comment on this case study. If you have not received such an email please contact us.